Located in the eastern part of Aichi Prefecture in central Japan about 40 kilometers from southeast of Nagoya. Okazaki is about halfway between Tokyo and Osaka, halfway between Kyoto and Mount Fuji. The main part of the city is fairly flat, with the old parts of town (near the castle) located on gently undulating terrain drained by the Yahagi, Sugo and Iga rivers. This flat area extends south past JR Okazaki station. There are some hills in the town (such as those behind Higashi Okazaki station where the National Institutes of Natural Sciences are located), however for the most part it is bicycle friendly. The sparsely populated hills to the east are steep and forested. As of 2010, Okazaki’s population is around 372,400 and it remains one of the faster growing cities in Aichi and the country. The demographic center of the city has been gradually shifting south, with large shopping malls such as AEON bringing the commercial heart of the city south as well. The population density is fairly evenly distributed, though large new apartment blocks near train stations are slowly making an impact on the distribution. A large proportion of the population work in the city, though there are also many commuters. The foreign community of about 10’000 people is also well established, with many foreigners running businesses or working as professionals in the city. The number of foreign residents as a percentage of the total population is well above the national average. The largest groups of migrants are from South America (particularly Brazil and Peru) and from China. By terms of nationality many of the city’s Korean residents are technically considered “foreign”, though for the most part they were born in Japan and are native Japanese speakers. Okazaki has many parks and compared to other cities of its size, a lot of greenery. Zoning is still a problem, and it is not unusual to see businesses (even factories) located to or inside residential areas, or rice paddies next to medium-rise apartment buildings. In the newer parts of the city zoning is more advanced. The parks range from small local parks (usually there will be at least 1 park within a 5 minute stroll) to large city parks such as Chuo Sougo – which has hiking trails through extensive woodlands, sporting facilities, recreational areas, a fantastic art museum and so forth. There is plenty of breathing space in Okazaki. If you haven’t been to Japan before, one of the things you may notice is that the seasonal variations are very pronounced. In Okazaki, winter is usually milder than in Tokyo or Kyoto, or even Nagoya for that matter, with only occasional snow. It can be very cold if it is windy. If you come from a warm climate please ensure that you either bring good warm clothing or budget for purchases in Japan. Summers in Okazaki are hot and humid, but again, less so than Tokyo, Kyoto or Osaka. If you come from a temperate or cold climate you will feel the heat. Light loose cotton clothing, shorts and suitable footwear are required. 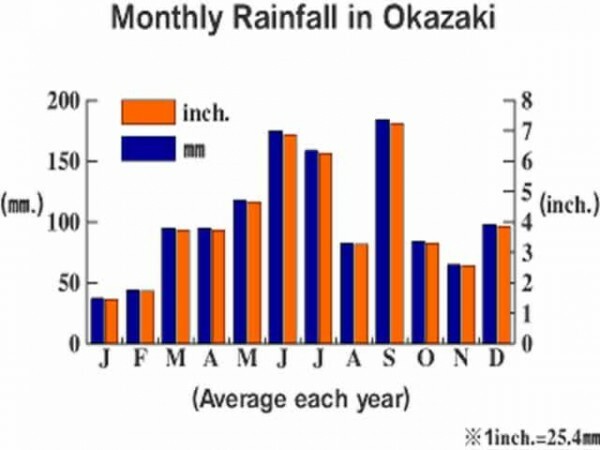 The average temperature in Okazaki rises and falls sharply during the course of the year. Light cotton clothing is essential during the summer. In the winter you are advised to bring warm clothing. The summer peak temperatures are a little lower than Tokyo and Kyoto (where the yearly seasonal change is very pronounced) – mainly due to the sea breezes. The Mikawa region and neighboring Shizuoka are said to have the most temperate climate in Japan – however all things are relative. The rainfall chart shows the average rainfall/snowfall in each month for the past 15 years. Due to the mild winter there is little snowfall in Okazaki. 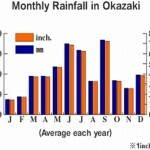 The wettest months tend to be in early summer (the rainy season known as “tsuyu”) and again in September when typhoons are often accompanied by heavy rains. Spring and Autumn have less rain on average and this combined with the weather makes it a good time to visit. Each season has its highlights – from the Fire Festival at Takisanji in the winter to summer’s Fireworks festival, but from a purely “climate” perspective, the ‘best’ time to visit may be Spring or Autumn. The cherry blossoms of spring and the red and yellow maple of autumn are what immediately comes to mind when you ask a local resident, but there is more. Most of the parks and gardens in Okazaki have a tendency to involve introduced species of plants (several hundred species were introduced after the 1868 Meiji restoration, the “rose garden” of Okutono Jinya being such an example), though the gardens of some temples and shrines can provide some idea of the diversity of the natural flora. Most of the eastern part of Okazaki is forested, including some tracts of relatively remote old growth forest. If you hunt around (and can read the language sufficiently) it is possible to obtain some good topographic maps for hiking. Large tracts of the forest though are (or were) managed for the lumber industry, with a considerable amount of replanting done after WWII. If you have an allergy to pollen, this can cause a few problems in March (in particular) due to the large number of cedar trees planted. If you are interested in seeing old growth and diversity, the lands surrounding some of the temples and shrines offer the best route. Due to the increasingly urban nature of Okazaki, large wild fauna is pretty rare. If you’re interested in seeing more than the specimens couped up in the small zoo in Higashi Koen, head to the rural/urban fringes east of the Tomei Expressway interchange and the valleys leading up to the towns of Nukata and Shimoyama. Here it is possible to find wild monkeys (Japanese macaques) and tanuki (a stout, short-legged creature with a small, bushy tail – a member of the dog family). The number of monkeys is said to be increasing, and tanuki are increasingly common in the winter, though not to the point where you can be guaranteed of seeing them in the wild. Deer seemed to have disappeared from Okazaki, or at least from easily accessible areas. To see wild deer such as Japan’s kamoshika it is necessary to travel further into the mountains to areas of the Oku-Mikawa such as Chausuyama. Bird watching is a fruitful exercise though, and local “birders” have produced some comprehensive guides (in Japanese) if this is your hobby. Learn Japanese language and culture – you are here, might as well….